Maruti Suzuki is expected to launch the 2018 Jimny in India sometime next year. If launched, the small SUV will replace the Maruti Gypsy, which has been around without any major changes for over three decades and is likely to be phased out after more stringent crash safety norms are implemented in 2020. 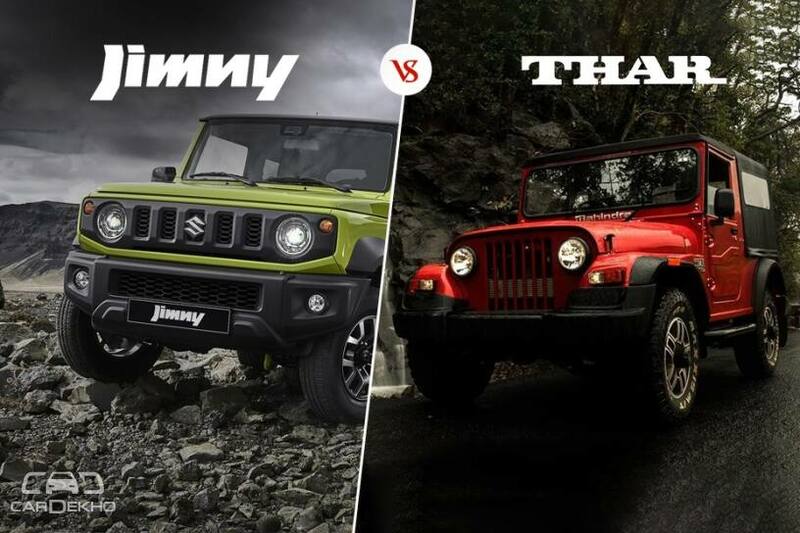 While we have already compared the Jimny with the Gypsy, let's find out how the upcoming SUV fares against its supposed arch-rival, the Mahindra Thar, which is also likely to be retired soon. The Thar has been the go-to vehicle for people looking for an affordable mud plugger. Hence, we can’t help but compare the Jimny against it on paper. From the above table, it is clear that the Thar is bigger than the Jimny in every dimension. As a result, the Thar has more space on the inside. While the Jimny can seat only four adults, the Thar can seat up to six. Like before, the Suzuki Jimny is only offered with a 1.5-litre petrol engine. The Thar, on the other hand, is only offered with a diesel motor - Mahindra’s 2.5-litre CRDe unit. While the Thar’s diesel engine is significantly bigger than that of the Jimny, it only produces 3PS more power and 117Nm more torque. However, the extra power and torque are not likely to not make the Thar more capable than the Jimny. That’s because the Jimny has a better power-to-weight ratio of 89.87PS/tonne against the Thar’s 64.07PS/tonne. The numbers speak for themselves, don’t they? The Jimny is better than the Thar CRDe in terms of ground clearance and departure angle. The Thar, however, has a better approach angle. When it comes to off-road tech, both SUVs seem to be evenly equipped as they get a recirculating ball-type steering, a low-range gearbox and shift-on-fly 4WD. Both SUVs also get locking differentials, but where the Thar has a mechanical one, the Jimny gets what Suzuki calls Brake LSD traction control - a simple system that cuts off power from free-spinning wheels and directs it to the wheels with traction. The Thar is very scarcely equipped. It even misses out on basic safety features like dual front airbags and ABS (anti-lock braked) with EBD (electronic brakeforce distribution). The Jimny, on the other hand, is packed to gills on this front. The Suzuki SUV gets six airbags (dual front, curtain and front side), ABS with EBD and brake assist, ESP (electronic stability program), TC (traction control), hill launch assist, hill descent control, autonomous emergency braking and lane departure warning. Other features on offer include LED headlamps with LED DRLs (daytime running lamps), automatic climate control, push-button start and a 7-inch SmartPlay touchscreen infotainment system with Apple CarPlay. The Mahindra CRDe is priced at Rs 9.24 lakh (ex-showroom Delhi), which is about Rs 3 lakh more than the Maruti Gypsy. If launched, we expect the Jimny to attract a premium of about Rs 1.5 lakh over the Gypsy. So expect it to be priced around the Rs 8 lakh mark. The Mahindra Thar is set to be retired soon in the wake of upcoming BNVSAP (Bharat New Vehicle Safety Assessment Program) crash test norms. If Mahindra plans to replace it with a more modern version, we expect it to be more feature-rich and slightly better suited for the urban environment as well. However, this will increase its price significantly too. Similarly, expect Maruti Suzuki to take away some of the features that the Jimny is available within International markets to keep its price in check. However, we believe it still has the potential to undercut the next-gen Thar, if both the cars are sold alongside in India. Given the fact that the Jimny and Thar are neck-and-neck when it comes to off-road-ability and that the Jimny appears to be a better vehicle for everyday use, we think it has an edge over the Mahindra. However, we can say for sure only after Mahindra unveils the next-gen Thar.